At the reception given to Rabindranath Tagore during his visit to Ahmedabad, April 3 - 5, 1920. Rabindranath Tagore and a boy, c. 1930. Rabindranath Tagore and Prof. Albert Einstein, c. 1930. Rabindranath Tagore and 2 others, c. 1930. 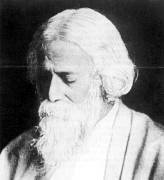 Poet and Nobel laureate Rabindranath Tagore, ca. 1935.